By their nature, portable flowmeters must have the ability to be installed and removed without breaking the integrity of the pipe. As such, clamp on ultrasonic technology is perfectly suited, with transducers simply mounted externally and the measurement signal propagated through the pipe wall to achieve measurement of flow. Whilst this non-wetted technology is particularly useful with aggressive or corrosive process liquids and gases, it has long been recognized that portable versions of the flowmeter were advantageous where intermittent measurement was required; surveying flow where no metering provision had originally been foreseen; or to check existing in-line flow meters. To achieve portability brings with it the issue of power. A portable ultrasonic flowmeter needs a power supply which is unlikely to just happen to be available adjacent to a new measurement point. An integral battery pack is therefore utilised, historically resulting in hazardous area use being controlled by a hot work permit along with the paperwork, downtime and working practices this rightly necessitates. Advancement in battery technology, however, has now allowed portable flowmeters to be approved for use in hazardous areas. 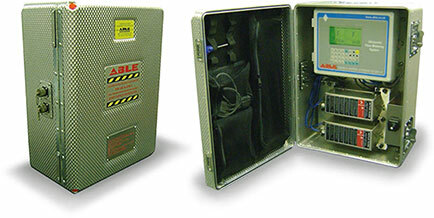 Whilst others may claim to be the first, ABLE Instruments & Controls have been working towards this solution for many years, leading to their design of a portable meter achieving ATEX approval in April 2010. Having supplied portable ultrasonic technology since 1985, the considerable real world experience gained told ABLE there were additional conundrums to be solved. Often the portable meter is actually used as a temporary measurement solution and left to collect data over time, continuously monitoring variations in flow during operation or upset conditions of the plant. Just having an integral power source suitable for hazardous areas therefore isn’t enough – longevity of the battery and the ability to lengthen this period of operation are equally important. ABLEs portable ATEX flowmeter battery pack provides up to 24 hour operation and the ability to swap the batteries within the hazardous area. The batteries themselves are Intrinsically Safe and interchangeable in minutes resulting in no requirement for the flowmeter to be removed from the hazardous area or directly connected to an external power supply for the batteries to be charged. 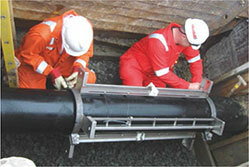 Underground, submersible installation for 56 inch (1425 mm) pipe. Clamp-on sensors are quickly installed, without interrupting flow. In its rugged aluminium case, the flow meter weighs less than 25kg making it suitable to carry onboard a helicopter for offshore service. The quick install clamp-on ultrasonic transducers use award winning WideBeam technology for accurate and reliable flow metering with high tolerance to wide flow velocities, fluctuating pressure and temperature, and entrainment. The flow computer provides all the features, data logging and outputs expected from the latest in ultrasonic flow metering technology and unique zero-matic path software eliminates zero drift and allows zero flow to be set without the need of shutting down the flow.